The great thing about the web is that commercials like the Trojan Olympics - despite not having syndication in the US or the cultural openness to air such content - spread like viruses on the web. That's true of anything on the web so I'll be more proactive in getting more funny international ads up on the site soon. Let me quickly add, I stopped looking forward to the Olympics a long time ago. Not sure if that was a question of preference or somehow the Olympic Committee started placing banana peels underneath their decision making process and lost me in the storm of planning and branding that is now the Olympics. Strictly personal opinion. I'll open up the comments box to your 'boo's' and rants! Moving along... one event I do look forward to is the SuperBowl. And I believe this year many interesting turns and hooks await for the marketers and advertisers. Moreso in the future but this is the year we break with the traditional and let loose the tidal surge of repressed creativity. Below is a clip from the new social media campaign launched by Audi. These police officers of the earth were set in motion to educate the masses on making small difference that really matter. As well as setting the parade in motion for the premiere of the new Audi Turbo Diesel, named Green Car Journal's 201 "Green Car of the Year." Very satirical clip, worth a watch! The first of 3 videos for this campaign that also includes a special contest leading up to the SuperBowl which will have athletes driving the cars from Miami to the Audi Headquarters in Virginia competing in the Audi Efficiency Challenge. The winner will receive $20,ooo for the charity of their choice! Very interesting move Audi. Let's see how well this works. So I must warn you that before you click on the rest of these videos in this post, they are not safe for work. I figured it was appropriate to get everyone in the mood for the upcoming Olympics, so I started searching for some Olympic Ads and I managed to find something that not only ties in with 2028 but it's also pretty amusing. I highly doubt we would see something like this in the US, so that's probably why the UK did it! What did you guys think of the Trojan games? Funny? Creative? I would like to hear your thoughts! In stark contrast to yesterday's post. We want to share with you a cleverly deceptive video produced to deliver a teen-pregnancy message. Titled '2028' this video makes for an eerie trailer for some new kind of catchy teen-flick yet quickly morphs into a warning against teen pregnancy. I'm not sure how this video would have affected my teen years leading into my college years but I know it got the message across pretty clearly this late in my sexual revolution. So I definitely praise the creators of this video for helping shed light on the disoriented youth of today. Watch the video below to get a feel of the nightmare that is teen pregnancy. The creators state a need to shake up potential teen conceptions that pregnancy is always pleasant and promises a happy ending. "We're trying to combat the glamorization of teen pregnancy by Hollywood," says Serve founder Gary Mueller. I found the context of the video and its shock/viral attributes to be commendable, hence the need to share. If you know of anything along these lines, let us know! My apologies for the birth control post! Saludos a todos! Good to be back after a hectic weekend of frivolity and late night decadence. And as a staple of my Monday-ease-into-the-week routine I spent the morning checking out funny links sent to me by friends. Halfway through my session, I was disgusted by a viral ad created by Ray Ban in consortium with Omnicom's Cultwater. This ad literally has the creative prowess of a sloth on crack because its both lame and whack! And how could this be cool or beneficial for a brand?!? On a positive note, I'm also including the first video collaboration between Ray Ban and Cultwater which became an instant online hit - 2.7 million views! And you can tell why, its original and clever but most importantly fun! So without further delay I present the two videos. The first video is the outrageously dumb 'face + tattoo' ad followed by the creative and cool 'sunglass catch' video. Enjoy! After watching that video, you question how the sanity of an individual is influenced by a brand. Not sure how the logistics or persuasion/motivation to do this came about but I'm going to give Ray Ban the benefit of the doubt. Now onto the viral video that made 2.7 million viewers happy! These videos made me think, what favorite brand of mine would I be willing to make a video for... I don't have an answer right now but next post I'll let you guys know. In the meantime how do you feel about the ads and what kind of viral video would you make? and for who?! I haven't been paying much attention to developing collaborations between brands but since the Adidas & StarWars post I've noticed there are a few great collaborations already out in the market. Take for example the video below that pays homage the the 'Risky Business' scene featuring the always delightful surprise that is Heidi Klum. This isn't the first ad collaboration I've seen between Guitar Hero and celebrities but I must say they do it very well! Check out the video below!! The point being as I scanned the airwaves I overheard Adidas and Star Wars being announced in spanish. For those of you who aren't familiar with me - I currently live in Mexico City and promise to keep you abreast of all international news from my side of the globe. Well... Despite my early morning grogginess I made an effort to decipher exactly what was being said about these two brands and as the caffeine slowly peeled back the veil of slumber I realized they were discussing the coolness of the Adidas video we shared with you the other day! It was really exciting to imagine how fast this commercial broke upon the international newswire and all the potential collaborations between brands that I imagined on my way to my meeting tickled me in delight. Speaking about delight, I'm already thinking of breakfast tomorrow morning! If I may ask, what's your favorite cereal brand? Or who do you believe does the best job marketing to little kids?? Coke Machine: Conditioning in Disguise? "Ferris... Ferris Bueller..." - That is one of my favorite of the DirectTV dubbed ads. And am also pretty clueless as to how they dub those movie scenes so well. I'm assuming it's a lot like the Japanese dubbed movies - which brings me to your next challenge! Any great Japanese commercials you can think of? Write us a comment if you know! In response to the overly-saturated soda drink market and the damage its causing upon society. I present this ad created by Coca-Cola to shed extra pounds of happiness upon the incoming "freshman 15"
Not sure where I stand on this, I guess I do like it because its fun and entertaining.. yet I feel like there is an element missing. Not sure what it is though - would love to hear your comments. I really liked the approach Direct TV took with this, but I still can't figure out how they managed to change what they said in the movie to say the Direct TV pitch! If anyone knows, please share!! Anyways, the reasoning behind this post was to try see how everyones 2010 resolutions were going! Probably the most popular one is weight loss, and that's why I thought this Ad was rather effective, but gross haha. Funny enough, the people behind this video had to include the video in HD because SD apparently wasn't clear enough haha. What do you think? "In a new effort to highlight the health impact of sweetened drinks, the Health Department is confronting New Yorkers with a bold question: Are you pouring on the pounds? The agency’s new public-awareness campaign, which includes posters in the subway system and a multilingual Health Bulletin, goes live today and will run for three months." 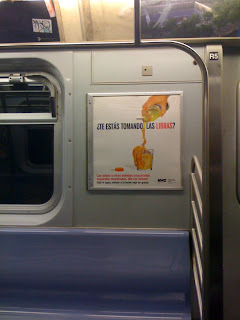 Thanks to Fast Food NYC for sending this over, along with the photo below he snapped on the subway! Has anyone in New York seen these around? Looking closely at the photo on the right, you can see that this Ad is in Spanish, and instead of a soda, it's a sports drink, which closely resembles a Gatorade bottle. Has anyone noticed any other Ads as dramatic as this? The Crossover of Your Dreams! 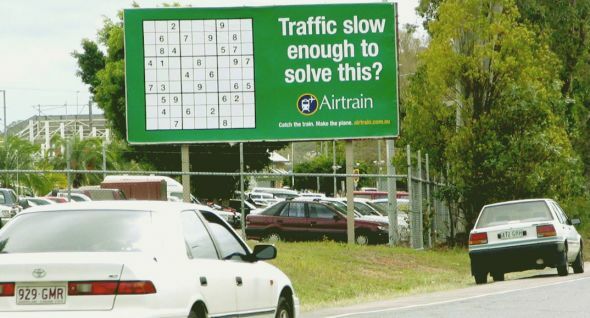 I'm horrible at Sudoku! I had a roommate who always came home from work with the sudoku puzzle on the back of newspapers completely filled out. I tried this for three days and abandoned any hope at the beginning of the fourth day! That roomie also had incredible taste for vintage adidas sweatshirts and would be blown away with the video included after the jump. Who am I kidding!?! After watching it - although not a fan of Star Wars -I wanted to hunt down those cool adidas shirts and sneakers. The ad is a great way for Adidas to kick off the new year with an extraordinary collaboration and the even crazier approval of overly-protective George Lucas. That alone makes it worth the click yet the video also features David Beckham, Daft Punk, Snoop Dogg and a very cool remix of the "Imperial March". I'll end this post with a question... what movie would you like to see collaborate with a brand? Top of mind, I'd have to say Back to the Future. Definitely make for a cool redesign of the sneakers, vest, backpack, hat and skateboard.. What's your take? The E-Trade baby is back! But this time E-trade picks up a new tot for its latest advertising campaign that will launch during the NFL playoffs this weekend. Any thoughts on whether E-Trade will have continued success with the use of these talking babies? Or is it getting old? I don't even know if we could consider this but I think it deserves a shot for next weeks "Best Ad Friday." Accenture recently dropped Tiger Woods as a representative for the company, but taking a look at the Ads he did appear in, I can't help myself but laugh and ask myself why? 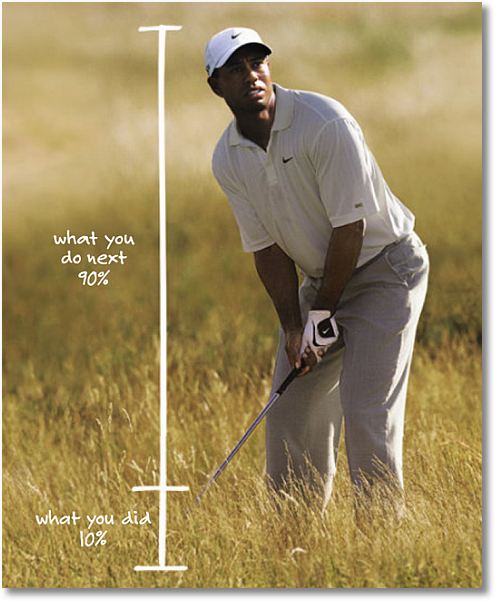 If you take a look at the Ad below and compare it to the situation Tiger is currently in, it really is "what you do next" that counts and not "what you did," that matters right now. Maybe Accenture would have got a lot more press if they continued their campaign? If Tiger somehow finds a way out of this mess, Accenture's campaigns make a lot more sense now! Anyways, something to think about, but I can't imagine Accenture bringing Tiger back anytime in the near future. 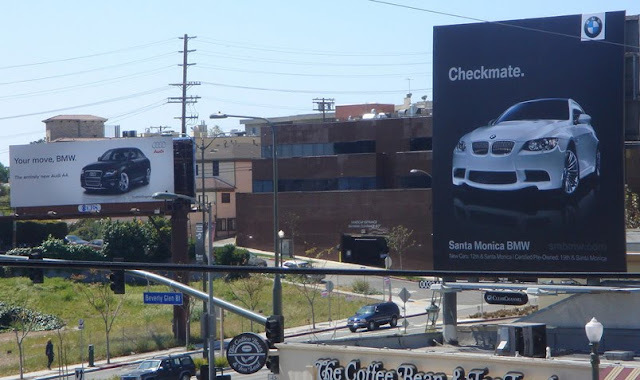 So Audi thought they had pulled a quick one on BMW but seems like they didn't give enough credit to the creative experts at BMW. It's your move now Audi. Welcome to Lipton "Tea Time". The commercial begins with people jumping into a pit filled with a variety of berries. At first thought, I thought this commercial would be better suited for advertising something like cereal because of the people jumping into a pit which somehow reminded me about a bowl?! Am I wrong here? Does anyone else feel that way? Anyhow, the commercial ends with a voice over saying "This is your tea time ... Experience the pyramid". I wouldn't have known the commercial had anything to do with tea until the very end. Am I missing any hidden images here or something? 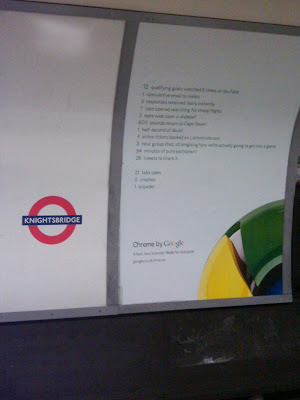 Walking around London and can't help but notice all the Google Chrome ads I have seen. I don't think Google has had such a big presence in the US but I could be wrong. Has anyone else seen these around?